As I stood waiting for the bus, I finally found a moment to observe the organized chaos of downtown: honking cars swallowed by traffic, old, grandiose Catholic churches, and the Tagalog language effortlessly melting with English. Amidst the hustle and bustle of this vibrant city, I feel a wave of peace and relaxation. I continue to wait, gazing down the road, until suddenly my eyes lock on a long, multi-colored jeep that looks as though it has been refurbished from World War II. I soon find out that indeed, it has, and the bus-jeep hybrid rolls past me at a speed slightly faster than a lazy jog. The peculiar vehicle is not at fault for its lack of motivation; the bustling traffic and heat of downtown Manila causes even the most type A personalities to take the back seat…if there is one. The “jeepney” rolls to a halt and dozens of school children clad in navy uniforms pour out the back with their parents. I gaze at the top of the vehicle and realize that at least twenty young Filipino men with beaming smiles had propped themselves up on the open roof. “Eighteen seats” becomes an irrelevant form of measure, and the most popular method of transportation now proudly holds at least 40 passengers. I let my gaze fall back to the overfilled streets, and I notice an outstretched arm raised above the splatter of traffic, and a subtle, casual wave. I see Dr. Joel Buenaventura, CFHI’s warm and passionate Medical Director, emerge from the crowd. I was lucky enough to visit the Philippines during March. This was a pivotal time of year to visit this vast country of over 7,000 islands, as local Filipinos graciously gathered to celebrate a group of empowering people which has long fought against the repercussions of marginalization worldwide: women. This March marked the 29th National Women’s Month of the Philippines. The “WE”: Women’s Empowerment. The “Make Change Work”: symbolically abbreviated as MCW, better known in Filipino culture as the Magna Carta of Women, a decades old women’s rights mandate with the goal to end gender discrimination once and for all, and it appears to be working. In 2011, the Gender Parity Index (GPI) for elementary school enrollment climbed to 1.03, indicating that 103 girls for every 100 boys had enrolled in elementary education. Women excelled in basic literacy and numerical skills, ahead of men by three and four percentage points in each category, respectively. How does a month celebrating women translate to health? 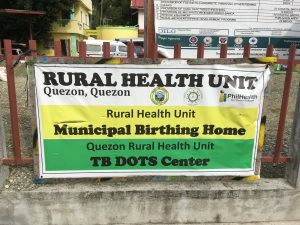 A demographic health survey conducted by the World Health Organization (WHO) indicated that over 60 percent of women in 2013 delivered their babies in a health facility, either at a rural barangay health station, clinic, or hospital. In comparison, the number of women who gave birth in a health facility a decade prior staggered at under 40 percent. A higher number of women giving birth in health centers allows for a consistent monitoring system throughout pregnancy, less complications during childbirth, and consequently, lower infant and maternal mortality rates. Additionally, the percentage of women who had access to post-natal care within two days after delivery jumped from 25 percent in 2003 to 65 percent in 2013. Throughout my site visit, I even uncovered that according to local Municipal Health Officers, there are just as many female physicians as there are male physicians, and that men and women have equal opportunities to pursue careers as nurses, midwives, and doctors. How do locals celebrate women’s month? They celebrate with beauty pageants, dancing, coconut festivals, health lectures on self-breast exams, and…pap smears; but not using the same Western methodologies to which many women are accustomed. During my visit on Quezon, Quezon island, I spent one full, enriching day at a barangay health station (BHS) 45 minutes outside of central Quezon. It was the third farthest BHS from the town center, and took a series of windy dirt paths, muddy rivers, and village crossings to arrive there. I shadowed Mika, a young, passionate, and knowledgeable nurse who conducted a cervical cancer prevention lecture for the local women from the surrounding village. While the lecture took place in Tagalog, I followed along with the accompanying images and roaring, knee-slapping laughter of the women as they curiously asked questions and bonded with fellow female friends about this (exciting) new topic. The second half of the lecture reiterated the importance of cervical cancer screenings, and the women proudly and confidently lined up for a check-up. Traditional pap smears involve gently scraping the cervix and examining the cells for abnormal growth, testing for the presence of precancerous or cancerous cells. In low resource settings, studies have found that visual inspection with acetic acid (VIA) is pivotal in assessing the presence of cervical cancer, and results are relatively consistent with conventional analyses. Cervical cancer can be a preventable disease, and VIA is an alternative, low-cost test widely implemented throughout BHS’s in the Philippines. 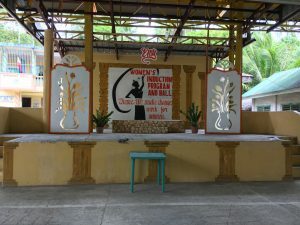 The women lined the barangay ready for their exams, entered into the system by writing out their names and date of birth, and obtained their cervical cancer screening through VIA. The reward? Banana-que, of course. Much like barbeque, banana-que is a ubiquitous street food in the Philippines and a famous form of mouthwatering skewered fried banana with brown sugar coating. We dove head first into plates of banana-que before saying our goodbyes and parting ways. Women’s month provided a welcoming avenue to address important and sensitive women’s health topics that are otherwise often difficult to discuss. My short time in the Philippines embodied a warm, empowering comradery that I deeply miss since my departure. 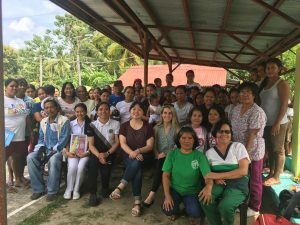 This blog details the “Remote Island Medicine Program” in the Philippines. Learn more about this program and others at www.cfhi.org/all-programs. This entry was posted in Local Experts and tagged philippines on May 11, 2017 by Keaton Andreas.